We make our own Garlic Spread - it's not difficult at all, and it jazzes up plain bread so easily. 1. Put all the ingredients into a chopper or blender and hit the switch. 2. Once the garlic pieces are pluverised, use a spoon and mix the spread more evenly. 3. Spread the Garlic Butter on any bread and pop it into an oven until you can smell the garlic aroma. 4. Serve the Garlic Bread with soup. 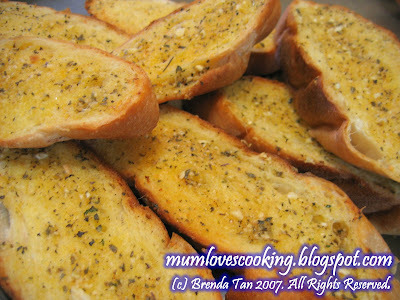 The Garlic Spread can be made beforehand and kept in the fridge until needed. While the spread can go on any bread, we love it on crusty French loaves.